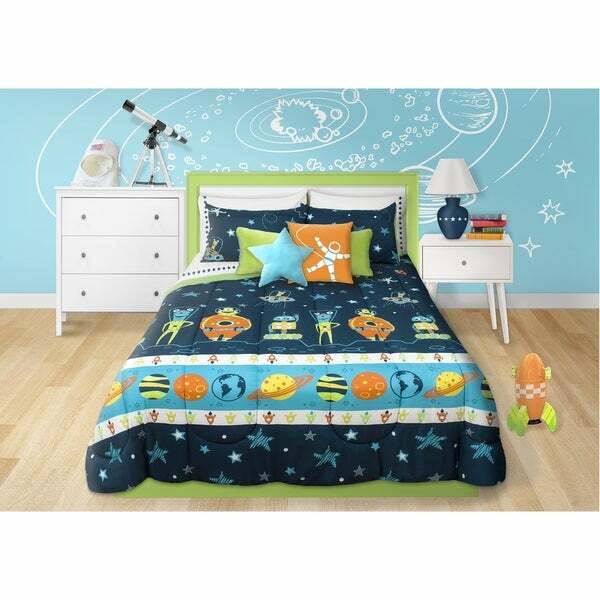 This Space Comforter Set is part of our newest designs from our Just Kidding collection. We make bedding fun and your child will love this exclusive design and the comforter is light, soft and warm and cozy. My son loves this comforter!! Te colors are beautiful and vibrant and match his room decor perfectly. The images are kid-friendly and it is super soft! I wish I could get the rocket pillow (not included) or other decorative pillows as shown but nonetheless we love it! Purchased this for my five year old son. He loves it, beautiful colors, comfortable and compliments the space décor in his room. Good value for the money. Vivid print, very soft fabric, perfect weight for a six year old. Fits queen size bed perfectly. It coordinates well with wall stickers, lamps and rug I found on this website. I am very pleased with this all weather quilt. Would like to be able to purchase the throw pillows pictured. Was JUST what I was looking for, for my 3-year-old son's space-themed room! Very colorful, looks just like the picture. My son absolutely loves! Would definitely recommend. These are pretty nice comforters. Great for kids under the age of 5. My son that's 5 years old thought it was kiddy :). They are moderately thick. It's pretty good value for money. Cute comforter set for my 7 year old grandson. The fact that it is not a specific super hero or trend is nice as he won’t tire of it quickly. Weight is nice and graphics are adorable! For the price this set is great. He has had this for about a year and has held up really well. Great set, my son loves it and it was good for the price!